What are some of Flexter’s benefits? Flexter completely automates the whole process of converting XML/JSON files to a relational format. No custom development is needed. This can save up to 80% of the overall conversion costs. You don’t need to hire external consultants with XML/JSON expertise. As one customer put it recently “You did in one day what would have taken us a year”. Flexter can process data in real time. As soon as an event happens in the real world it can be analysed instantly with the help of Flexter. Flexter eliminates project risk. We have seen many XML/JSON conversion projects fail. The failure rate grows exponentially with the complexity of the XML/JSON and the volume of data that needs to be converted. Flexter is big data ready. We have built scalability into Flexter from the ground up. Flexter can scale up and out across multiple servers. It can handle any volume of data and meet any SLA. Flexter significantly shortens the duration of XML/JSON conversion projects. Developers can focus on data analytics tasks that add value to the business rather than having to wrangle with XML. Flexter can meet any service level agreement. In tests it was an astonishing 800 times faster than competing solutions. Flexter handles different versions of XML/JSON standards gracefully. You can compare different versions of the standard and generate upgrade scripts between different versions of scripts automatically. No coding needed. Step 1: The Schema Analyser is a dedicated module that loads, parses out, processes and stores the XML/JSON schema information in Flexter's internal metadata DB. This step is only required to be performed once for each schema to be processed. You can either supply an XSD or a representative sample of XML/JSON files for this step. Step 2: Now that we know the exact layout of the source XML/JSON it is possible to generate the relational equivalent. Flexter's module, Mapping Generator generates the output schema layout and the mapping to it. Various optimisations of the target schema can be applied during this step to make the schema more compact. Step 3: The XML/JSON Processor module takes the information generated from the two previous steps, processes the XML/JSON, and writes the data to the relational target schema. Do you support very large XML files? Yes. Flexter supports very large XML files greater than 1 GB. I already have an ETL tool to convert XML/JSON. Why do I need Flexter? 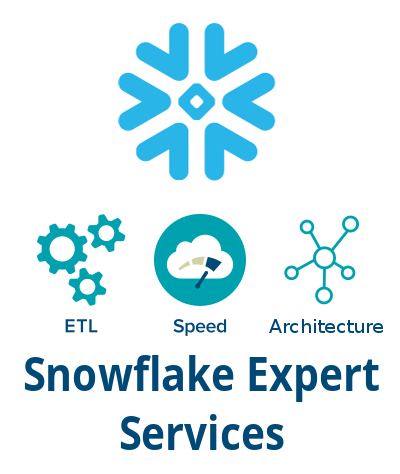 ETL tools don’t scale beyond a single server for XML/JSON processing. ETL performance for JSON/XML is poor. We have seen ETL processes running for 22 hours to process a small number of 50K XMLs. Here are two blog posts where we compare Flexter against two popular ETL tools. Do you support real-time use cases? Yes. Flexter supports real-time use cases through its streaming engine. Yes, we offer version control. With Flexter you can easily identify what has changed between different versions of your XMLs/XSD, e.g. which elements have been added or removed. Which input formats do you support? We support both individual XML/JSON files and batches of XML/JSON files in archives and compressed formats (zip, gzip etc.). We can pull XML/JSON files from network drives, (S)FTP servers, HDFS, S3, XMLTYPE/CLOB/BLOB, BJSON in databases etc. Which target databases do you support? We support any relational databases, e.g. Oracle, MS SQL Server, DB2, PostgreSQL, MySQL, Redshift, Snowflake, BigQuery etc. Which text formats do you support? We support comma separated and tab separated files as output. Which Hadoop formats do you support? We support Parquet, Avro, and ORC. We also support Hadoop SQL query engines, e.g. Hive, Impala, Drill, AWS Athena etc. Do I need an XSD to convert my files? You don’t need an XSD to convert your XML/JSON files. Flexter optionally analyses a sample set of your XML/JSON files to generate a target schema. 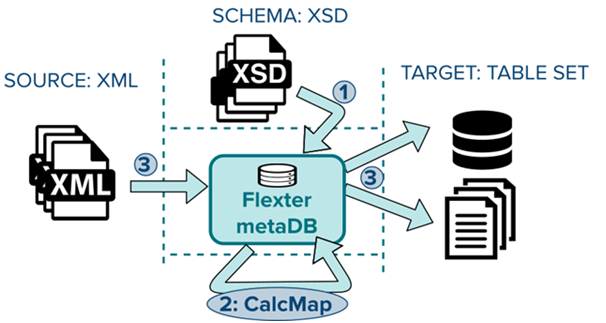 The advantage of having an XSD is that Flexter can apply better optimisations to your target schema. It will also minimise the issue of constraint violations and other data quality issues. How do you generate the target schema? We generate the target schema based on the information from the XML/JSON, the XSD, or a combination of the two. If you can't provide an XSD we generate the target schema from a statistically significant sample of the XML/JSON files. In summary you have three options to generate the target: (1) XML/JSON only (2) XSD only (3) Combination of XML and XSD. Should I use the XML/JSON, the XSD, or the XML + XSD combination to generate my target schema? This depends on what your requirements are. If you want a more compact schema just use the XML/JSON. Flexter will only consider the XPaths it encounters in the XML/JSON sample files you provide. As a result there will likely be less attributes in the target schema. The downside of this approach is that your XML/JSON sample may not contain all of the possible XPaths of your data set. New and unexpected XPaths will be initially ignored by Flexter and written out as warnings to an alert log. You can gather stats incrementally to cater for those scenarios and evolve your target schema over time. If you are only using an XSD to generate the target schema all of the possible XPaths will be translated into the target schema. The target schema is more verbose and complex. If the XML files you process conform to your standard then you should not get any warning messages. However, we often see that XSD designers have been sloppy and do not properly define relationships, cardinality etc. in the XSD. For those scenarios its best to use both the XSD and XML. For gaps and sloppy design in the XSD we override the schema with the stats from the XML sample. What happens in the case of failure? Flexter can gracefully recovers from failure and picks up from where it has left off. Errors are logged in the error log. My XML/JSON files are quite different from each other. Will it still work? Yes, as long as there is some overlap across XML/JSON files. As a rule of thumb 50% overlap is sufficient in most cases. I have a one off requirement to convert a large volume of XML/JSON files. We offer Flexter as a service and cater for one off migration requirements. Typical scenarios include conversion of Terabytes of historical XML data or a migration from a legacy XML database to a relational database. Do you support schema evolution for XML and JSON files? Yes. You have various options. (1) You can run multiple schema versions side by side and create a unified logical layer, e.g. Views on top. (2) Flexter can generate delta code (DDL) to evolve your schema at design time (static schema evolution). Which industry data standards do you support? Are there some videos that show how Flexter works? Do you support Hadoop and Spark? Yes. We support popular Big Data formats and Hadoop SQL engines, e.g. Hive, Drill, Impala etc. Will you support other formats than XML in the future? Yes, we are now also supporting JSON. We are working hard to liberate data from other complex or proprietary formats such as Excel Spreadsheets, MS Access, EDI etc. What technologies does Flexter use? Flexter uses Spark and Spark Streaming as execution engines. It is written in Scala. Can I call Flexter programmatically? Is there an API? Yes, Flexter can be called from the command line or through its RESTful API. What are some typical Flexter use cases? Flexter can be used for batch loading large volumes of XML/JSON files into a data warehouse. Flexter can be used to trickle feed XML/JSON files in real time to an analytics engine. Flexter can be used for data exchange scenarios that require translation of XMLs/JSONs to a relational format. Flexter can be used to migrate large volumes of historic XML/JSON files to a database. Flexter can be used to migrate an XML database to a relational database. Do you run Flexter as a managed service in the cloud? Yes. Please reach out to us with your specific requirements. One of our customers is Aer Lingus. They ran into performance and scalability issues with their existing ETL tool. We implemented our platform Flexter Data Liberator to solve the problem. No custom development was needed. We just installed and configured Flexter and everything was up and running in a day. Flexter runs on Linux or Windows. How do I install Flexter? Flexter ships as a Windows MSI or Linux RPM installer. The installation and configuration process is simple. Can I run Flexter on premise? Can I run a PoC or a pilot? Yes. Please contact us with your use case. Does Flexter integrate with my ETL tool? What is the difference between free Flexter and the enterprise version? Where is Flexter installed on a Hadoop/Spark cluster? Where does processing happen? The Flexter binaries are stored on the edge node. Processing exclusively happens on the data nodes in parallel.